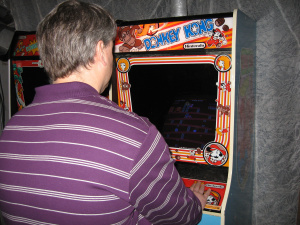 In the documentary The King of Kong: A Fistful of Quarters, Steve Wiebe travels to FunSpot Arcade to put a stop to all the naysayers disputing his record-setting Donkey Kong skills. To the amazement of everyone watching, he achieves the first ever kill screen on the Funspot Donkey Kong machine. Wiebe scored another kill screen this past weekend at Richie Knucklez Arcade, but this time, so did three other players. 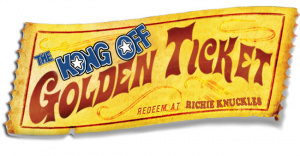 The Kong Off is a competition thrown by Richie Knucklez, a New Jersey arcade owner and friend of Billy Mitchell. 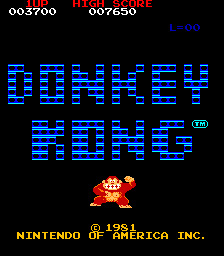 It gathers together the best Donkey Kong players in the world to compete in marathon gaming sessions to see who can post the highest score. 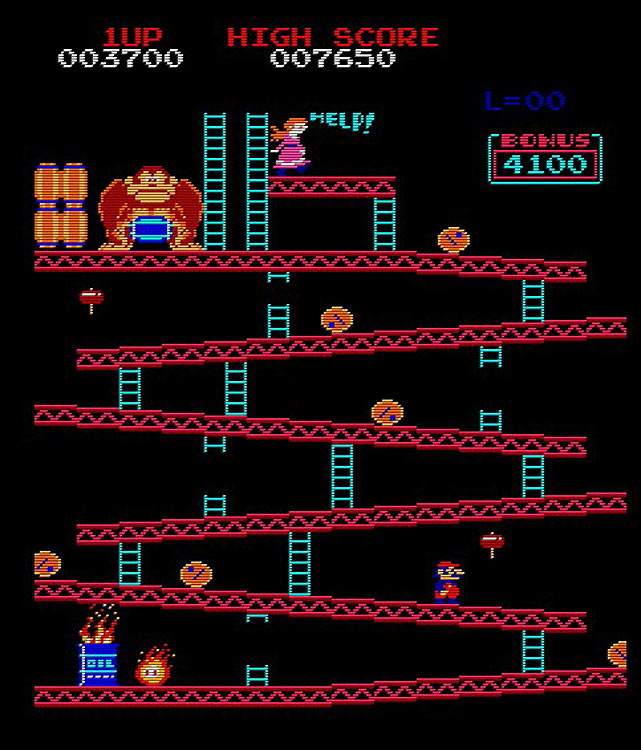 On the first day, 11 Donkey Kong players all competed side by side for a marathon ten hour session, each with their own cabinet and unlimited credits – and we were there to live blog the action as it happened. They returned to the arcade the following day to do it again, this time for five hours. 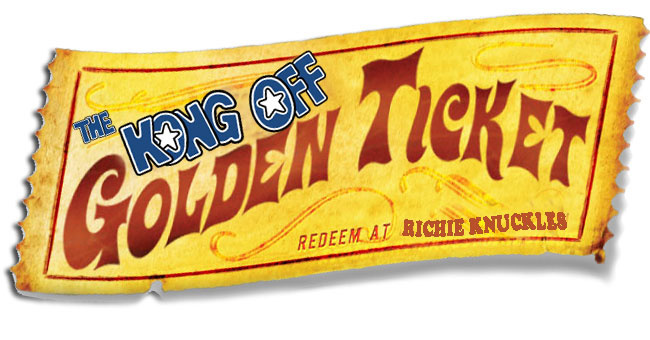 The player to post the top score at the event would win $1000 from Richie Knucklez. 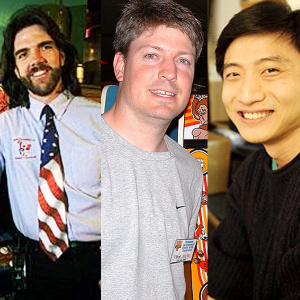 While Hank Chien, Steve Wiebe and Billy Mitchell were all there, other lesser knowns were able to put themselves on the map, some even beating out the stars for a time. The first kill screen of the event came from Eric Howard, a Rhode Island player who put up a score of 941,800. While other players would eventually beat his score, Howard was the only one to reach a kill screen with an extra life still in reserve. Not bad for a relatively unknown player! Howard's score was beaten later in the day by Chien, who lost his last man only moments away from a kill screen but still scored 981,500. 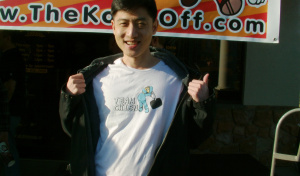 Sporting his Team Chien t-shirt, he returned the next day determined to outdo himself, taping a piece of paper that read “1,000,000 or bust” to the top of his cabinet. Before he got a chance to do so, however, Steve Wiebe scored the second kill screen of the event, beating out Chien with 986,900. After doling out some high fives and spinning a disco ball in celebration, Wiebe departed for his flight home. Moments after he left, a crowd gathered again around Hank Chien. Less than a half hour after Wiebe left, Hank reached his own kill screen, beating out Wiebe with a score of 994,400. That score would last him the rest of the competition, pushing Wiebe to second place and Howard to third. The final kill screen of the event was achieved by Vincent Lemay, another lesser-known player from Quebec. Lemay plodded on after all the other final games died out. The youngest player there, he reached a final score of 851,900, placing him fifth overall – two spots ahead of Billy Mitchell's final score of 821,200. Richie Knucklez put the entire thing together, and was nice enough to catch up with Nintendo Life right before the second day of the event kicked-off. In our interview, we learned about his TV pilot, next year's Pac-Off event, why Walter Day says he's "the most important person in video gaming right now," fixing up old arcade machines, and that he is “good at everything.” Except Photoshop. Nintendo Life: So, when did you start this arcade? Richie Knucklez: Approximately four and a half, five years ago. Well, we opened for business approximately five years ago. We've been doing this for years and years and years, but just recently, within the last five years we opened this store for a show room and it's been wonderful. NL: What made you want to start an arcade that focused on the older games? RK: The only thing I would ever do is old games, we don't even own a new console. NL: What's the youngest machine in here, is it the Terminator one? RK: Yeah probably Terminator is the youngest machine. I would say so. NL: How many of these old cabinets did you have to refurbish? "We're going to try and do a TV series. 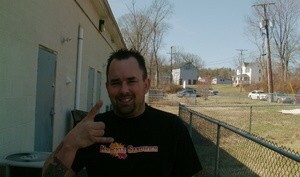 American Pickers meets Pawn Stars meets American Restorations meets American Choppers." 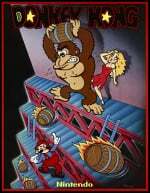 RK: The Donkey Kongs or in general? NL: Let's start with the Donkey Kongs, are those all yours? RK: They are all mine except one. There's one machine. One of them was borrowed off a friend Steve Wagner. The only reason we borrowed one was is it was originally top ten… K? Top ten players. Kyle Goewert comes up a week ago and puts up 980K points. How can you not invite him? NL: So you had to go get him. RK: Actually my son, he's the one who did the research. Contacted him, said “If my dad says yes, do you want to come to the Kong Off? The guy's like “Hell Yeah!" So a friend of mine, Steve Wagner, who is the Berzerk world record holder, called me up and says “I have a beautiful Donkey Kong at home, all it needs is side art. If you buy me a set of side art and restore my machine, it's yours.” And so he brought it in. If you notice, you can't even tell the difference. It didn't have any side art, I changed the marquee, threw some side art on it, cleaned it up, fixed the monitor – the monitor needed to be recapped – and in the line-up it went. "Billy Mitchell will be in every episode, he's like my right hand man." NL: Are you big into fixing up old cabinets? RK: I like fixing up the games more than I like playing them. Ask my wife. If I have a day off, I want to go to the garage and tinker. I just want to get in there. NL: What is it you have to fix usually? Is it more cosmetic or is it more technical, like rewiring the boards? RK: From soup to nuts, I like it all. I own a printer, it's a 42 inch AutoCAD plotter. I used to be in a band, Knuckle Sandwich, we were low budget at first, I had my own record company called Punch Records, so I had to teach myself graphic design, fliers, album art, you know, all that kind of stuff. And I'm actually pretty good. Pretty good at Adobe Illustrator, all vector art, I made the Kong Off marquees, the sign above my building, I designed that. The banner, I designed all that. It's all my graphic design. "'You are the most important person in video gaming right now.' These are Walter Day's own words!" In fact, you'll like this one: Punch-Out! !, the video game Punch-Out!!? If you buy on the internet reproduction Punch-Out!! side art from the professionals, silk screened, I'm the one who drew that. I drew the Punch-Out!! side art. 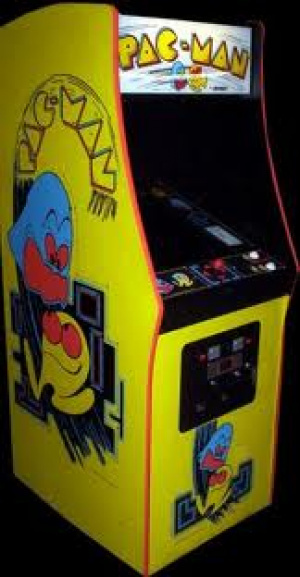 Anywhere you get it on the internet, there's no one else selling it but mainly Quarter Arcade.com. I drew that and he commissioned me to be the vector designer. Check out the shirt on this guy – (points to a t-Shirt with the Pole Position game logo, replaced with the text “Richie Knucklez”) – I designed that as well. I have the highest Pole Position score in the last 26 years. I'm only one second behind the world record. NL: I was going to ask you if you held any records. RK: Billy Mitchell put out ten grand for whoever who could beat the world record from 1983 on Pole Position, and I'm one second behind him. I'm almost there. NL: What was the first cabinet that you found that was old and decrepit and you had to fix up? RK: I was 19 years old, I'm 42. So at 19, I bought a Punch-Out!! machine. That's why. NL: Why is it important to keep retro gaming alive? What does it represent? RK: You know, I don't really know if it's important to other people, but it's very important to me. I feel that when we were kids, my childhood friend Paul, he and I would go to the arcades and we'd just own. "We are going to be introducing a series of contests every year. The next one... is Pac-Man"
NL: So is it like a social thing? RK: Well we would walk in and we were the best at the arcade. If you walked into an arcade, I had a crowd around me. 30 or 40 people watching me play just because whatever I do I'm good at. Hey, you know what? F--- it, I'm cocky. Whatever I do I'm good at. I was the best at my arcade, so was he. We were the best two players at our arcade. I'm good at restoring games. RK: Actually Illustrator. Photoshop, I'm awful. NL: Oh OK, so that's the one thing. RK: And if you notice, there are very rare Nintendo games in there. Did you see the Versus Slalom kit? NL: Oh yeah, I did see someone playing that. "I honestly feel that Hank Chien is the best. He's my hometown hero, he's our Joe DiMaggio. He's our Babe Ruth." RK: It is the first. You know how you got the Wii Balance Board? RK: Because we do — sorry, I lied, we have Wii Fit at home because my wife and I are trying to stay fit, stay healthy, so we have the Wii Balance Board, which I never play, but it's the same idea as the Slalom thing. It is one of the first interactive games that actually has skis, and it was in 1983 by Nintendo. So I brought in a piece of history. RK: In his tighty whities eating Cheetos? NL: Yeah, do you kind of want to dispel that image? RK: I don't want to dispel an image. It's just not what I want to portray. What we're doing here is something totally different. We're trying to give a whole different feel on video games. We're social, everyone is friends. 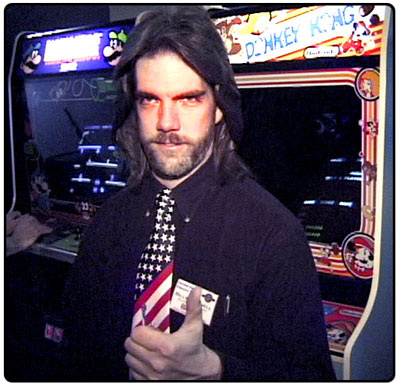 "Billy Mitchell... and I are starting a chain of arcades together, called... K.O.K." NL: It is competitive, but very positive? RK: It's positive competitive. Not competitive like “I'm gonna get you WWF style and jump over and drop an elbow" on your competitor. We want everyone to be friends afterward, shake hands and have a lot of fun with it. One of the main things we're trying to do here is get everyone together on the same page, because there's a lot of players in this industry. Video games are one of the big things now, they're bigger than movies. Do the history, it's bigger than movies. There's a huge chunk, and really, I saw the King of Kong and said nobody can see this? That if you get Twin Galaxies to get their act together, if you get this Hall of Fame thing off the ground. If you get friends with the guys from FunSpot – which we are, we are very close with the arcade FunSpot – get all of the arcades to work together, to do events, and keep track of it on the internet. Our friend Dave Hurley came up with a brilliant, brilliant piece of software that will connect everyone. So if there's a contest going on here in New Jersey and there's a contest going on in New Hampshire, through the internet we don't have to be in New Hampshire, our guys can compete against their guys via the internet without skipping a beat. It's Aurcade. I have an interest in the company and its going to revolutionise the way we do contests. "Video games are one of the big things now, they're bigger than movies. Do the history, it's bigger than movies." NL: As far as The Kong Off, how long have you been planning it? RK: I had this idea for at least two years. NL: Was it hard to get all the players together? RK: Oh, it was impossible. Our family life definitely suffered from it because of all the time I tried to put into it. Thank God that we're still smiling and we're still here. One day I'm going to write a book. Walter Day called me today from India this morning, and I sat over there underneath hanging from the basketball thing while he gave me a pep talk. He said "Richie, I was here 30 years ago, where you're at, and you're carrying on the torch." And he gave me a little pep talk. "Get in there with your game face a friggin' kill it. For me." He actually said "Billy Mitchell may be the most famous video game player on earth," but he said "you are the most important person in video gaming right now." These are Walter Day's own words! He said that to me so it, you know, it got me pumped. "One of the main things we're trying to do here is get everyone together on the same page, because there's a lot of players in this industry." NL: Why do you think it's important to have these DK players play face to face rather than alone? RK: Well there's two different things. One thing is you know the true best player who can do it on command, that can do it with distraction, with people around you. NL: With Sirius Radio guys putting microphones in their face. RK: Putting mics in their face! I honestly feel that Hank Chien is the best. He's my hometown hero, he's our Joe DiMaggio. He's our Babe Ruth. But everyone else here is amazing as well. Steve Wiebe had a great game going until these j---offs [with the microphones] got a jump on his back and tried messing with him. NL: He had three reserves and he was at like 600K. RK: Last night was chaos. I'm also a little embarrassed about how last night went down, but you know, I'm only one person I'm trying to do my best. I hope no one's mad at me. It seems like everything that I was trying to achieve, with bringing everybody together, it seemed for a minute that they were trying to unravel it. But I think that by the end of the night everything worked out. "The Pac Off – We'll see you in a year! Or two. I need to go on vacation." NL: Do you still have plans for a TV pilot? RK: Absolutely. There are people here from MTV – I get yelled at for dropping names all the time, so I'm not going to drop any names, but yes, there are people here, very popular famous people from all the biggest stations. We're going to try and do a TV series. American Pickers meets Pawn Stars meets American Restorations meets American Choppers. NL: Are you going to be fixing up old arcades? RK: Fixing up old arcades, and it's all based on old arcade games and competitions like this. I will be the host, Billy Mitchell will be in every episode, he's like my right hand man. 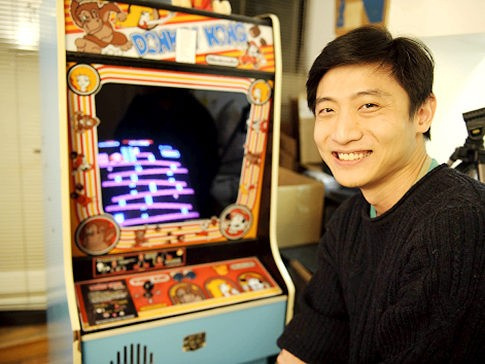 He and I are starting a chain of arcades together, called of course — that's why we are trying to brand — K.O.K. NL: Isn't one of them in an airport right now? RK: One of them is in Orlando Airport, it's called King of Kong Arcade. We also have a website called the Kings of Kapitalism. RK: With a K, but for right now, because you know it's in its infant stages, if you want to check it out and buy some merchandise, it's the Kings of Capitalism but with a “C.” But it will be changed, we'll have both. (Looks to his cameraman) Hurry up, before this interview goes out, go buy it! We're going to go buy it in a few minutes! NL: If our readers want to connect with Richie Knucklez, what's the best way to do that? Do you have a team of players? Forums? RK: Yeah, there's two ways. You can go to Richie Knucklez. com, which is spelled with a Z. My e-mail is simple, [email protected]. Or you could watch our web show. We have a web show every Friday night which is on Justin TV. It's simple: JustinTV/RichieKuncklez. We broadcast every single Friday. NL: Is there anything else you'd like to let our readers know? Is there anything upcoming? RK: Yes. This isn't the last. Even though this is going to be very hard to top — no doubt, it is going to be hard to top this one — but we are going to be introducing a series of contests every year. The next one — and this is a scoop, we haven't told anyone yet — the next one is Pac-Man. RK: It's going to be called "The Pac Off," and everyone can make a joke about it being called the Pac-Off (quickly gestures his hand up and down). But hey, you know what, it's going to make people laugh, it's going to bring people in. NL: Do you know when that's coming? RK: I'm not going to say anything else other than: The Pac Off – We'll see you in a year! Or two. I need to go on vacation. Nintendo Life would like to thank Richie Knucklez for taking the time to answer our questions. This may be my favorite interview that we've ever run. Great job, Patrick. Great job, Richie. I love it! The behind-the-scenes guy who fixes up the place always got the most to say! Great read. In a day and age when arcades are all but dead it's cool to see that somewhere they are thriving. Thanks Richie, it was a blast! I would get along great with this guy. I love fixing these arcade cabinets, although I tend to stick with the Japanese cabs. Great interview Patrick! Ahh omg this guy. Best review I've read on NL. Good work guys! 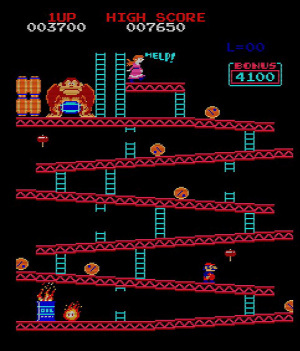 and still Nintendo fails to capitalise on the resurgence of Kong spawned by KOK by making the arcade game available on VC! This is a brilliant interview. I made my wife watch 'Fist Full of Quarters' and she ended up loving it. So, during the event I let her read your earlier play-by-play post and she was cheering Wiebe on...until the media got in his face. I got to mess with her and told her Billy Mitchell won - that got her fired up - she wants to meet him and punch him in the face. It wouldn't be nearly as interesting without the bad guy, though. Great interview ! Richie is awesome ! We love his arcade! (lets go back to the 80's) long live arcades !